The Brighton based duo are back with another cracking album. Since Nile Rodgers joined forces with French megastars Daft Punk and silly-hat fanatic Pharrell Williams on Random Access Memories, disco has been back in fashion. Who would have thought that that a music genre so regularly derided would enjoy a renaissance period some three decades later? Today it seems that almost everyone wants a slice of the disco action. For those of us who enjoy good disco, this is no bad thing. It’s great that disco has been reclaimed from the ridicule of music history. Disco isn’t just feel good dance music, it’s also a culturally significant art form capable of shining a light on the ways of the world. Yet, given how fashionable disco has become, many of the most recent disco-sounding records released in the last few years or so can only be be described average as best, featuring nothing more than standard, throw-away riffs and little lyrical imagination. Thankfully, it’s not all bad news, particularly for us in the UK. Fortunately for us, this island nation has an impressive array of neo-soul and neo-disco artists, none more impressive than the talented Brighton-based duo of Soulpersona and Princess Freesia. And they’re back with their latest release Sunset City to save us all from mediocre disco. The album cover for the new Soulpersona album starring Princess Freesia. Soulpersona and Princess Freesia have a great track record when it comes to producing dynamic neo-soul and disco. The duo, who’ve recorded albums separately and together over the years, are independent artists who have successfully crowdfunded their most recent projects. This time around, we’ve had to wait a little longer than user for their latest offering. Soulpersona’s last solo album Momentum was released back in 2015, and Princess Freesia’s last solo effort came out in 2016. But the wait for for new material has been worth it. Sunset City is, as the accompanying press release describes, an disco-concept album that “explores the echelons of a society set in the idyllic fantasy land of Sunset City”. Yet, even in this imagined paradise, society remains unequal, and “the underlying cracks beneath the glamour and glitz are evident”. Could Sunset City be an imaginative and cutting social commentary about the city they all home, the supposedly perfect Brighton-and-Hove? It’s a city that appears very pleasant and very wealthy (and, sometimes, quite sunny) but nonetheless struggles with many of the same social and economic issues that plague every other city on Earth. Perhaps. Perhaps not. I could be reading too much into it, but it’s an interesting idea to explore in austerity Britain, where many people are struggling to get by. Anyway, back to the music. 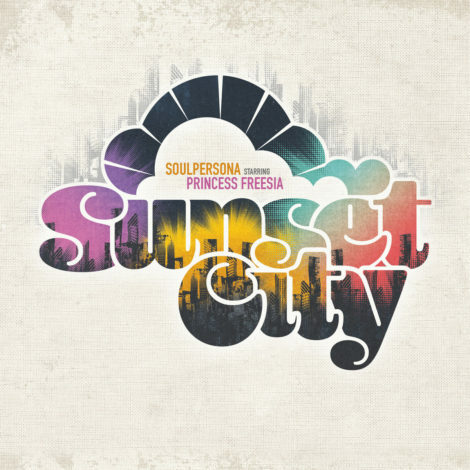 As long time admirers of Soulpersona and Princess Freesia have come to expect, Sunset City is another masterclass in how to produce a quality independent record. The songs are great and the production is superb. The responsibilities are split on the album: Princess Freesia writes the lyrics and provides the impressive vocals, while Soulpersona composes, produces, arranges and mixes. The division of labour clearly pays off. And in fairness to the duo, to call this a purely disco album would be wrong, it’s really an amalgamation of funk, disco, soul and more. The album opens with a tasty seven minute overture titled ‘Sunset City Theme’, which not only sets the scene of this idyllic fantasyland (a city “where the boys are pretty”) but also the groove and feel for the rest of the album. In fact, the song would be perfectly suited for the opening credits of a detective drama based in some sun-kissed part of the California coast (a female Lethal Weapon perhaps). It’s a great opener and leads nicely into ’S.C.P.D’, on which Princess Freesia imagines what it would be like to have an all-female police department. Sunset City might be an imagined paradise, but here even cracks emerge in society, as explained on ‘The Grifter’ and ‘Tryin’’. The latter features an outstanding groove, making it pretty hard to listen to while remaining seated and still. The rest of the album follows in a similar vein. As usual, Soulpersona’s production is stunning and the grooves he weaves are always infectious. Princess Freesia meanwhile handles all the lead vocals on the album with ease, punctuated with more than a hint of sass. She also has a knack of writing clever lyrics that explore some pretty deep social issues. While the whole album is very impressive, particular highlights include ‘Music Man’, a sublime tune that sounds like it’s straight out of the eighties groove era, and ‘Anything Goes’, which features a baseline that sounds somewhat reminiscent of The Jacksons’ ‘Shake Your Body’. Equally tasty is ‘Sunset City Lady’, a hot piece of funk on which Princess Freesia sounds excellent. Listening to Sunset City I was struck by how much it reminded me of The Miracles’ City of Angels album. That album was released in 1974 and by that time The Miracles recorded it Smokey Robinson has left the group and had been replaced by Billy Griffin, a versatile singer-songwriter. Like Sunset City, City of Angels was also a concept album. It told stories about Los Angeles, a destination where people across the world hope will be the place to become rich and famous. But as that album made clear, the City of Angels isn’t the paradise that it’s often portrayed. The notion of Sunset City reminded me of this later-era Motown classic. It’s not a perfect comparison as, after all, Los Angeles is certainly a real city, whereas Sunset City is fictional. But, both are clever concept albums about human interaction and survival in a city, and both feature some pretty tasty disco grooves and impassioned singing. All-in-all this is another impressive album from the talented duo. If the duo had been releasing this sort of quality back in the original days of disco, or even in the post-disco grooves of the eighties, they’d surely be much more well known than they are. In the internet age, everyone can be an independent artist. There’s so much independent music out there it can be hard to carve out a niche and a following. Yet, that’s just what Soulpersona and Princess Freesia have done. For artists like these, the internet is both a blessing and a curse. It’s a curse because their music makes them very little money from streaming sites, and their music can easily be copied and ripped and chucked on sites like YouTube and alike for people to enjoy for free. But, on the flip side, without the backing of a label, the duo can go directly to their fans and crowdfund their albums, giving them time and space to work their musical magic. It’s not a perfect solution. Crowdfunding is unlikely to solve the dilemma of being able to live as full-time musicians, but it at least provides the opportunity to produce music they want. As a result, their music has been enjoying much praise. Thanks to the success of the album there is now a Sunset City remix EP that includes contributions from Yam Who?, Alan Dixon, Hober Mallow and TFSR favourite John Morales. And if that wasn’t enough, the duo has announced a special London show at the Brixton Jamm on Friday 7 September (early bird tickets are just £15, so get in quick!). Plus, as an extra bonus, Soulpersona has been commissioned to produce remixes for the new comeback album from Change. Sunset City is one of the best albums we’ve heard all year, and it’s great to see independent Britain-based artists leading the way. Who knows, in post-Brexit Britain our disco and soul music might become our biggest export. You can purchase the album on Bandcamp.